Is Malaysia university entry a level playing field? Soh Boon Khang scored a perfect mark of 4.0 in his high-school exams. He was confident that this grade would allow him to become the first doctor in his Chinese family. Mr Soh wanted to become a surgeon, specialising in oncology. He applied to medical school but did not get a single offer from a government-funded university. "I feel very frustrated and very sad. I cried three times because I used to believe that a diligent student who excelled at academics stood to get a chance," he said. Hanie Farhana, meanwhile, who achieved a cumulative grade point average of 3.75 out of 4, was recently accepted into medical school. She comes from the country's Malay majority, also known as Bumiputera. Some of her non-Bumiputera friends who scored higher marks did not get into government-funded universities, she said. Ms Hanie felt she was given advantages over other races, such as access to certain scholarships not available to non-Bumiputeras. "It is stated in the social contract back to independence [from the British] that Malays get special privileges and rights, whereas the non-Malays have their citizenship," she said, but added that she still worked hard and deserved her place. Malaysia is made up of 60% Bumiputeras, 23% ethnic Chinese and 7% ethnic Indians, with the remainder made up of other races. Since Bumiputeras traditionally lag behind in education and business, under national policies, they get cheaper housing, priority in government jobs and business licenses. 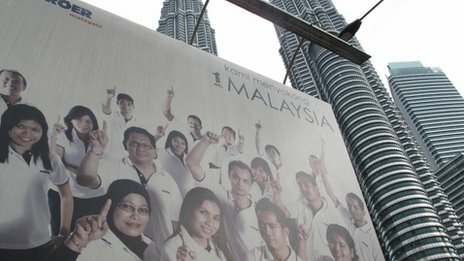 Malaysia also used to set ethnic quotas in government-funded universities to ensure that more Bumiputeras had access to higher education, but that system was abolished in 2002. Since then, Malaysia's education ministry has said the system is based on merit. Ethnic minorities dispute this. The academic year begins this month, and of the 41,573 places in government-funded universities available, 19% were awarded to ethnic Chinese and 4% to ethnic Indians. The rest of the seats were mainly allocated to Bumiputeras. Senator Jaspal Singh, with the Malaysian Indian Congress, which is part of the governing Barisan Nasional coalition, described it as the most unfair and biased university intake for ethnic minorities in decades. Mr Jaspal said records showed that the number of Indians who applied to government-funded universities had remained steady, but those who were offered a place had dropped by more than half compared to a decade ago under the racial quota system, where at least 8% of the public university intake were Indian. Ethnic Chinese representatives report that their student intake went down by a third in the same period. "This year's intake resulted in many students with [perfect scores] of 4.0 cumulative grade point averages not getting courses of their choice, or worse, not being given places at all," said Mr Jaspal. Something was broken in the system, he said. Deputy Education Minister P Kamalanathan was unable to confirm or deny whether the number of Chinese and Indian students accepted into public university had gone down since 2002. But he told the BBC that this year's figures alone showed that the system was based on merit. "The success rate of the Chinese community in university is the highest in this country," he said. Mr Kamalanathan said of all Malaysians who applied to universities in the 2013-14 academic year, 76% of ethnic Chinese were successful compared to 72% of Bumiputeras. The success rate for ethnic Indians was 69%. A poster showing Malaysia being a multi-racial country against the Petronas Towers in Kuala Lumpur. Malaysia has 60% Bumiputeras, 23% ethnic Chinese and 7% ethnic Indians. Some students were left out, he argued, because there was big competition for a limited number of places on courses traditionally favoured by ethnic Chinese and Indians. Government data showed that there were 10 applicants for each of the 119 spots in the dentistry programme this year. Some students with perfect scores refused to be placed in programmes other than the ones they opted for, he added. The system is also not all based on academics, he said. Under the merit system, a student's academic marks account for 90% of the evaluation while 10% is based extra co-curricular marks. A student could also be rejected if they did not do well in a face-to-face interview with the university administrators. "The entire university intake issue in Malaysia has nothing to do with race," he said. It is a statement that is not easy for Mr Kamalanathan to say, since he is also part of the MIC party that Mr Jaspal belongs to - which is now pushing for more transparency. He said that the problem was perception, and admitted that the ministry had not been forthcoming in the past with figures of the racial breakdown in universities. But others argue that university entrance is an unfair playing field and racially segregated. Two of the most popular pre-university courses are matriculation and STPM. The former is in practice mainly reserved for Bumiputeras and can be completed in under one year. Most ethnic Chinese and Indians are therefore limited to STPM, which takes almost two years and is seen as more academically challenging because it is tied to the University of Cambridge local examination syndicate and equivalent to British A-levels. The education ministry says the two programmes are comparable. "So it's already an unfair platform even before you apply for university," said Mr Chong.But Chong Sin Woon with the Malaysian Chinese Association said there are big discrepancies in the marking system in pre-university courses that has led to a widespread belief that the Chinese and Indians have to work much harder to compete with the Bumiputeras for the same university places. As the party's youth education bureau chief, Mr Chong used to receive a couple of complaints from students who achieved perfect marks but were not offered anything. This year, the MCA said it received a record 19 cases, which is alarming for Mr Chong. Earlier this year Prime Minister Najib Razak blamed his Malay-dominated coalition's weaker performance in the May general election on a "Chinese tsunami" - Chinese voters deserted him to back the opposition. The lower number of Chinese in government-funded universities is perceived by some as a backlash against the community, said Mr Chong. His MCA party, traditionally the voice of the Chinese community within the governing coalition, lost half its seats in parliament. For the first time since Malaysia's independence from the British, the MCA has no members in the cabinet. Mr Najib has said he will help the affected students, but did not address the underlying feeling of discontent among the ethnic Chinese and Indians. Mr Chong said the country needs to streamline pre-university exams for all races to create true meritocracy. Otherwise they will leave, and they do, says Mr Chong. According to the World Bank, the ethnic Chinese make up the majority of the brain drain from Malaysia. "The system should nurture talent," he said. "Instead, we are creating generations of people who think that this country is unfair." Meanwhile, Mr Soh's appeal against his university rejection is still pending with the government, but he has already decided to register in a private institution. He said he is disappointed with the government-funded universities, saying the whole experience had made him question his love for the country. "If I have offers from overseas for a job after graduation then I think I will leave the Malaysia because the country doesn't appreciate me," he said.